This pillow helped my husband who constantly woke up during the night. Now he sleeps soundly and comfortably. He no longer sweats all night either, the pillow is nice and cooling. Transform your bedroom with these bamboo pillows! Used to help relieve common sleeping problems such as tension and stiff neck. Great for back, stomach or side sleepers. Conforms and adjusts perfectly to your head and neck. 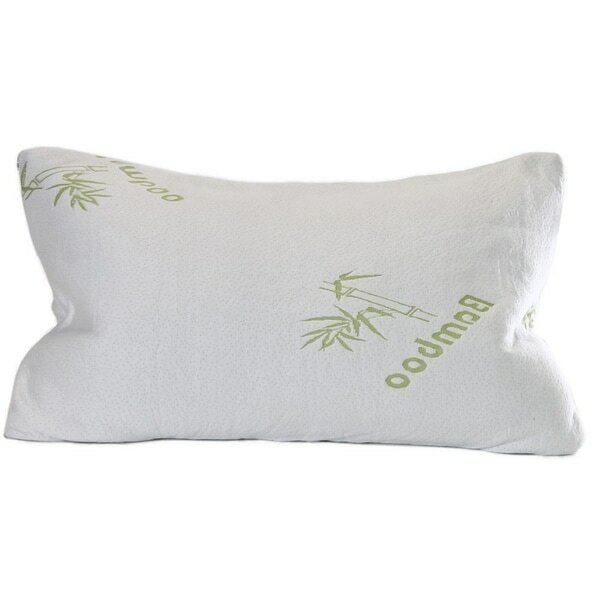 Combination of the shredded memory foam and the bamboo cover allow the pillow to breathe and stay cool. Regular pillows lack the support that many people need while they sleep, causing back and neck pain. Other memory foam pillows don't provide adequate airflow to keep the pillow cool and comfortable. Our pillow is the best of both worlds. Not only does it have the perfect amount of support for any sleeper, it is also made of shredded memory foam to provide amplified airflow. Airflow helps keeps you cool, making this pillow the best choice for everyone! Treat yourself to the luxury of top-rated five-star hotels every single night! The unique Memory foam was advocated by physicians to increase fresh airflow throughout your pillow. Our Memory foam pillows have been used to help reduce: snoring, insomnia, neck, back, head pain, night sweats, even allergies! Our customizable, shredded memory foam was designed to comfortably support and conform to the contours of your head, neck and shoulders. Our Premium memory foam supports your neck, back and head while maintaining maximum breathing, absorption, moisture-wicking fibers that help keep your pillow fresh, clean and allergy-free! When your pillow arrives at your door, pull it out of the case and toss it in the dryer on low for 10 minutes to fluff the pillow. Buy yours now with our 100% SATISFACTION GUARANTEE! Dimensions 24.0 In. X 18.0 In. X 6.0 In. Exactly what I needed. I love bamboo pillows! The flexibility and firmness is perfect because I toss and turn during the night. And they keep my neck in the right position. I love this pillow. It is so comfortable and supportive. The only downfall is it took 24 hours to expand once removed from packaging. Comfy . I’m a male but I have six of these pillows for my Cali king. Sleep like a rock with these. "How long does it take for my pillows to fluff up from the packaging?"